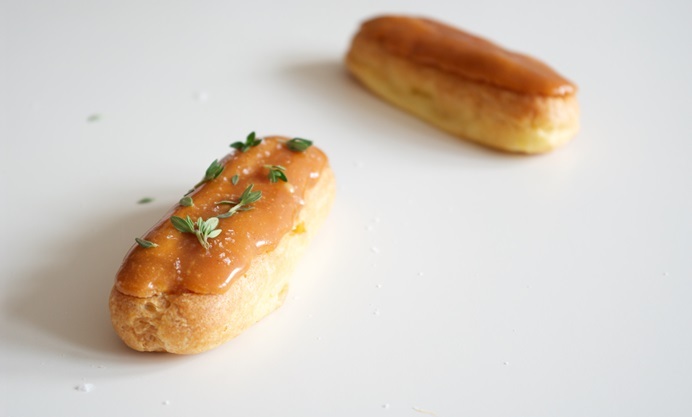 This éclair is packed with luxurious, homemade salted caramel – both in the smooth, golden pastry cream and the thick layer of glaze. 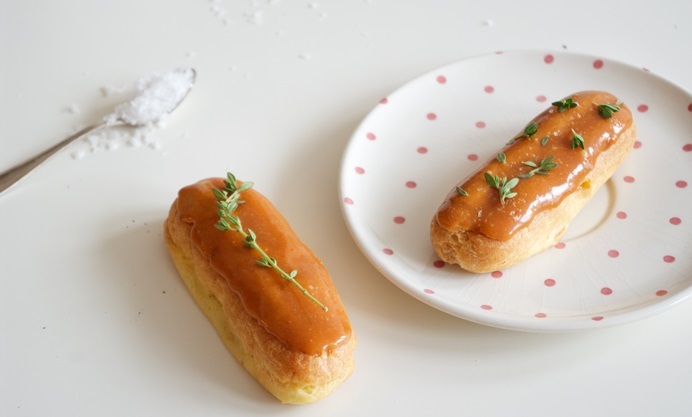 Although rich, the pastry cream is light and silky, and the caramel is balanced by the herbal, bright notes in the thyme. 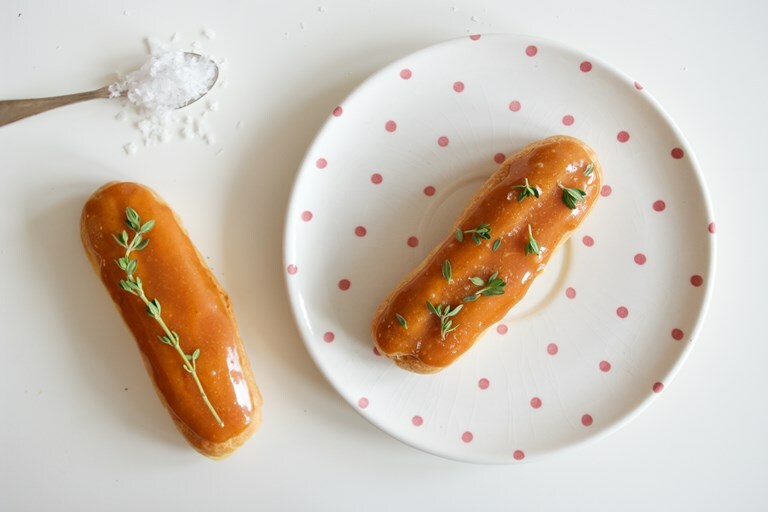 A sprinkle of fresh, bright lemon thyme adds a little herbal contrast, and the flaky sea salt used to decorate the top brings bursts of crunchy texture and saline flavour. Although I chose not to include them this time, strawberries make a great addition to this dessert and help to balance the caramel if you don’t like things too sweet. Trim and slice them into 4mm pieces and press into the pastry cream before adding the glazed top (pipe in a little less pastry cream to leave room for the berries) or arrange the slices on the lid for decoration. Or just serve on the side. 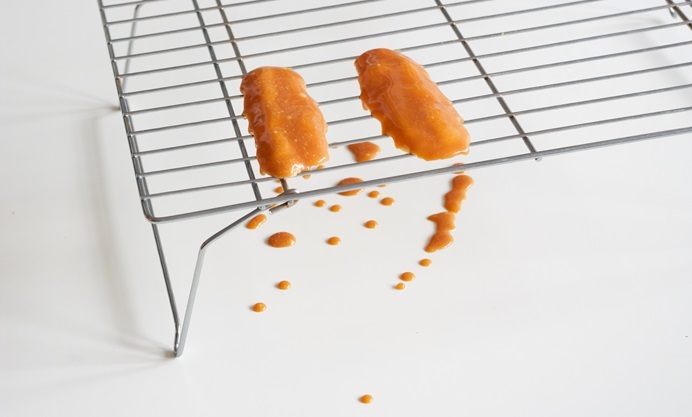 You might have more salted caramel than you need for this recipe, as I have allowed for factors such as residue left on the pan. But there are plenty of uses for leftovers! It will keep for at least two weeks in the fridge – just bring to room temperature or warm slightly to soften before use. Place the sugar in a medium, heavy-bottomed saucepan and heat over medium-high heat. Leave the sugar completely undisturbed until it starts to melt. When you see it begin to caramelise, shake the pan from time to time so the sugar melts evenly – do not stir. Be very careful not to burn the sugar! 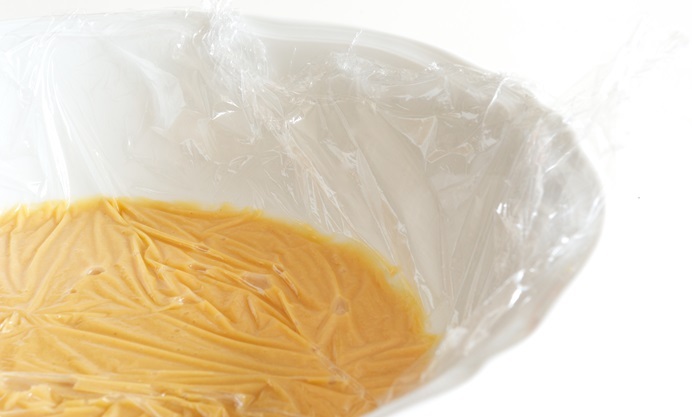 When the sugar is completely melted, continue to cook until the caramel is very fluid and dark golden brown – the darker the colour the more bitter the caramel will be, so you can adjust the cooking to your taste. 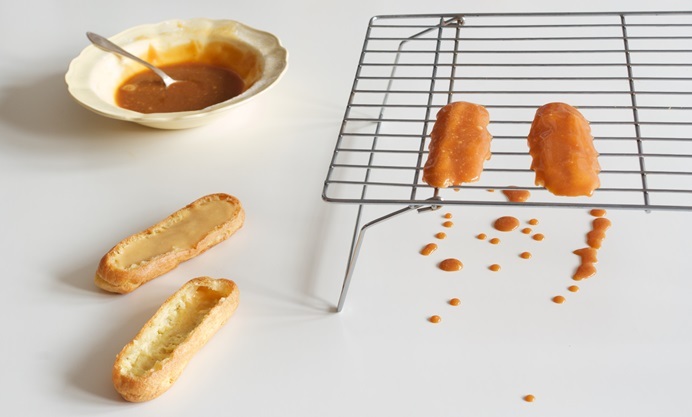 If you start to see wisps of smoke, you are very close to cooking the caramel too much!